Life is So Busy, Right? Many of us are running through each day trying to get "it all done," while some are just trying to get through the day. Work, parenting, school, activities for kids, house projects, community involvement, social activities and friendships, care for aging parents... the list keeps going. Well, we all try to pack it all in so that feel we are being productive, but in the process, we often lose sight of what we always wanted for ourselves and our family. Take Back Your Health & Happiness! Over time, despite our best intentions, our health and happiness fall of the priority list. We see a gradual change happen--lack of energy, a bit of weight gain, a harder time getting to sleep, unexplained aches and pain or a bit of tension in our relationships. We know we need to make changes but feeling healthy and happy take a back seat to the endless daily list of "to do's." 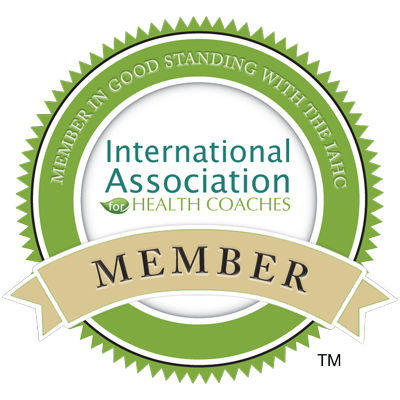 As a Health Coach, I create a supportive environment that will enable you to achieve all of your health goals; putting your health and happiness at the top of the list. I have studied all the major dietary theories if weight loss is your goal, and I use practical lifestyle coaching methods to guide you in discovering which approach works best for you! Are you Tired of Feeling Boated, Sluggish, Tired, + Uncomfortable In Your Skin? Are you Ready to Change Your Health + Weight -- but have no idea where to start? Do you want Someone Who Has Been There, Like Me, to guide you through this life-changing process? Most approaches dwell on calories, carbs, fats, proteins. Instead of creating lists of restrictions and good and bad foods, but there is so much more to health. What about our friendships, our family and our work life? Do they inspire us? Do they nourish us in a positive way. I coach my clients to create a Happy, Healthy Life in a way that is flexible, fun + free of denial + discipline. No one way works for everyone! I will guide you to find the food + lifestyle choices that best support you. I will also help you to make gradual, lifelong changes that enable you to reach your current + future health goals. It's time to Be Happy, Be Healthy & Thrive!